Even I do not like to go to the bank. It occurred to me that the prevalence of online banking and electronic money flow could be a result of the prolonged arduous banking experience people want to avoid. Institutions recognize this distasteful experience as they desperately try to change history and tradition to current reality and something disguised as appealing. Can you see the “café” at Capital One? Today I opened a business checking account for Somatic Finance® and it took almost an hour. Arriving at the empty bank and being told to sit in the reception area was my first twitch. A limp weird attempt at a handshake from the bank personnel about to help me was my second twitch. My third twitch was sitting at the desk and struggling to hear the questions delivered fast clip and without eye contact. My demeanor became crusty. I could feel niggles, knots and my contracted energy swirling inside with the already suffocating energy of the cubicle. There were several more twitches before I chose to try something different. Rationally, I knew this person was simply doing her job and the best she could. She had nothing to do with the forms, the requirements, the disclosures, the CYA papers, the popping Merrill Edge advertisements, or the second-grade writing for the two choices of checking accounts. She had nothing to do with the lack of integrity I have always felt when I enter into a bank and they try to sell me on the newest deal – if I change something about my present banking situation. Once when I was with my young son at the bank helping him open an account, I abruptly and blatantly responded to the clerk – “No, I am not interested in your new system. I do not trust that it is beneficial to me or to my son at all. I believe it is designed to make more money for the bank. Therefore, I would like to remain with my current choice.” My son was completely mortified. He asked why I was so upset. I did not have a great answer. I behaved like a jerk. In the softer space I saw all that I am offering now, in this writing. Isn’t it remarkable how immediately disdain arises? My body was pissed off before it walked in the heavy glass door. Way too many embodied memories of being in this place, or others like it, brought tension to the surface – the “bottom line” truth that I do not trust large financial institutions. I do not believe, for one nano-moment, that my interests are at the forefront of their policies or the resulting offers to their clientele. And, I am guessing, that you do not believe they have your interests at heart either. 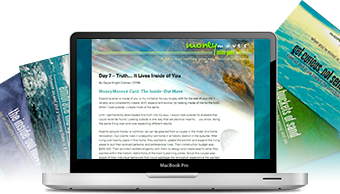 How can any money experience be tuned with truth – even if I am the only presence bringing it? What wants to be revealed for the betterment of all? How can my energy be generative to the situation? How can my presence catalyze others for generative output? What is it within me, closer to home, that is ready to be released, as it relates to banking institutions? As I ask and feel into the last question, my breath deepens. My back tingles. My belly rounds out and full. My eyes close. My fingers pause. And a single thought appears. On behalf of humanity, we matter too. Constructive rest arises. How interesting. I remember I promised more about constructive rest last month. Constructive rest is. My tip for now is to release any specific or general ideas about what rest is, how rest arrives and the way it takes shape. I’m now resting with ease as the words come forth. My spine is lengthened, my chin is slightly down, my eyes are lower as they view the screen, and my breath flows with ease. And you are here with me, resting. My rest is pulsing between no movement and slight movement, constructively. Energy is rising in my core, a flow from my lower belly to the top of my head. My motivation is writing in the present moment to honor my statement that I would offer more about constructive rest and constructive action. Perhaps, my action is to answer the beliefs that financial people don’t care. When in reality, many, way too many to count, are fiercely stomping on behalf of humanity in response to systems that no longer work, if they ever worked. To meet whatever is arising, we practice constructive rest, and abide there – embodied – while life takes shape in the money world. Rest then reveals constructive action.